Fans of True Blood and Elementary can have their cake and eat it too. Emily Ford presents a classy, clever, unique love story set in a society still raw from the Human-Vampire War of the 1960's. Human oppression of vampires is considered the new norm, but things begin to change when a powerful group of live blood drinkers plan a political upheaval of the status quo. For Vampire-Americans to become legal citizens in America, they must successfully complete 6 months of live blood rehab followed by 6 months of 24/7 observation by a sober companion. Elias Alexander, a legendary thousand year-old vampire of celebrity status, decides to give up his illegal vampire lifestyle in order to fit in to American society. After spending his entire life waiting for his true love, Elizabeth, to continually reincarnate due to a witch’s curse, only to keep dying in her 25th year of life, Eli is losing hope that he will ever be able to hold on to her permanently. Eric Wayne claims to hate vampires and is court ordered to work as a sober companion to avoid prison time for his violent act against one. 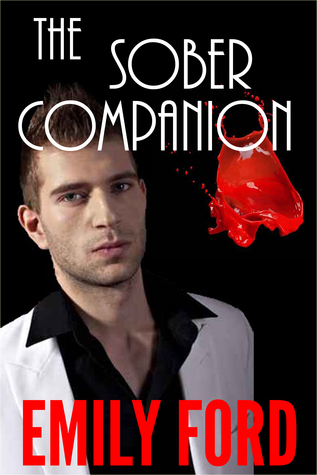 Hiding his own self-destructive addiction, he is assigned to the celebrity vampire who he comes to admire as they develop a deep bond that transcends mere friendship. When Eli determines Eric to be the modern day reincarnation of Elizabeth, he is faced with the most difficult decision of his life. He must choose either to save a mortally wounded Eric by turning him into a vampire, or to let him die in hopes Elizabeth will reincarnate again in her original form. The definition of love is put to the ultimate test as Eli and Eric struggle to fight for what is right amid a hostile world of oppression and corruption, meanwhile learning to depend on each other to survive. I really enjoyed this book. I’ve never watched Elementary but I did enjoy true blood and I definitely see where fans of True Blood might like this. Anyway I thought it was an interesting take on Vampire and human relations. I liked Eli he was witty funny and an interesting vampire. He gives up his illegal vampiric lifestyle in order to get his american citizenship. Which means he has to start drinking synthetic blood, get a sober companion and as part of his parole ( not sure if you’d call it parole but I’m lacking for the actual term right now) he has a job helping the police catch murders by using his vampiric abilities. Not only does he have that all going on but he is on watch for the reincarnation of the love of his life ( who was cursed to die at the age of 25 and only remember him then and then reincarnate and he’d have to woo her all over and try to convince her to become a vampire.) Anyway this time the reincarnation of Elizabeth ends up being his sober companion Eric who has some secrets of his own. But all in all it was a great story with action, mystery and intrigue. I liked the ending. Enjoyed the characters and humor. It was fast paced easy and fun to read.